Students from the Olney Youth Advisory Council participate in a community beautification project. Register now to join UrbanMain at the 2019 Main Street Now Conference in Seattle, Wash., March 25-27. From now until March, we’ll be giving you a preview of educational sessions geared towards larger cities and neighborhood districts. First up, The North 5th Street Revitalization Project in Philadelphia, Pa. will present a session highlighting their Youth Engagement Transformation Strategy, which focuses on the the equitable youth-adult partnerships identified as keys to social transformation and sustainable community change. Members of the Olney Youth Advisory Council will present, including council president Kimberly Rodriguez who notes, “Learning about the community we live in and stepping up to help make a change, is one of the best choices I've ever made!" 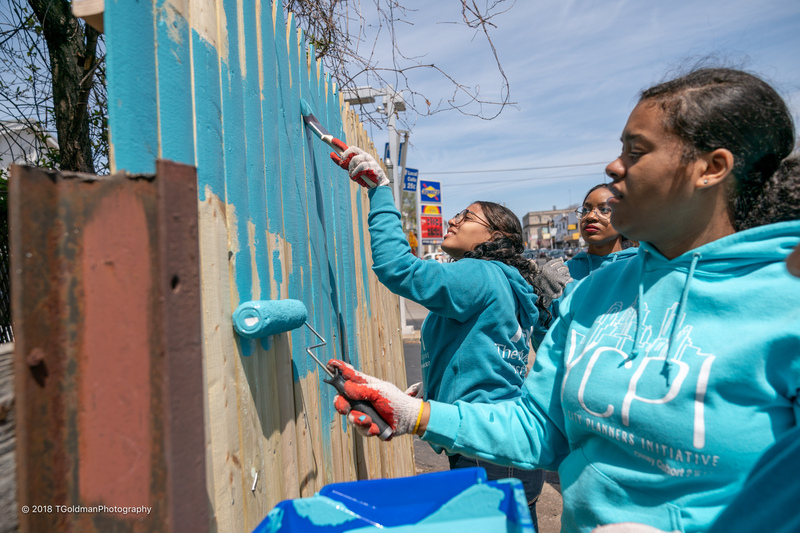 Learn how North 5th Street Revitalization Project in Philadelphia empowers young people who live, work, or play in the Olney neighborhood to revamp their main street and inspire community pride. Our panel will discuss our experience in bridging the gap that lies between youth voice and community development. We will highlight the work of the Olney Youth Advisory Council and their efforts to host community events by youth for youth, including their community School's Out BBQ, Back to School Bookbag drive, Community beautification projects and a youth-led, youth-focused Parking Day. Join us March 25 - 27 in Seattle for Main Street Now 2019! We encourage you to take advantage of the early-bird, member rates, and the civic leader discount. Not a member? Join today! Interested in receiving UrbanMain news and updates? Email mainstreetnews@savingplaces.org with the subject line "Subscribe to UrbanMain." We also encourage you to follow us on Twitter.